I love red velvet cupcakes. I think it might be safe to say that I am a red velvet cupcake snob. Some that I’ve tried just don’t meet my standards. All that I ask is that it’s moist, red, and delicious. In my short baking career, I have come across one magnificent recipe that is my go-to recipe for any and all occasions. And that is Elisa Strauss’s recipe in The Confetti Cakes Cookbook. A friend of mine forwarded me this link for the red velvet cake recipe that is rumored to be used by the Waldorf Astoria. I thought I’d try this recipe as well as Martha’s Red Velvet cupcake recipe in her new book. 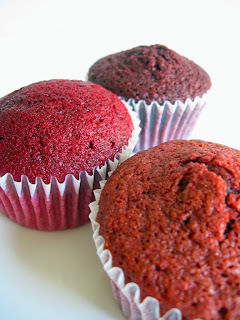 Red Velvet Cake originates from the south and used beet juice in the recipes. So, I thought I’d try using real beet juice. Sift the flour, salt, cocoa powder and baking soda in a bowl. Set aside. In a standing mixer, cream the shortening and sugar together until light and fluffy. Add the eggs one at a time. Add food coloring. Measure buttermilk and add vanilla to it. Alternate adding the sifted dry ingredients with the buttermilk/vanilla making sure to scrape down the bowl after each addition. Add the vinegar to the batter and mix by hand. Bake at 350 degrees. Whisk together flour, cocoa, and salt. In a standing mixer, mix together the sugar and oil. Add eggs one at a time making sure each is fully incorporated. Mix in food coloring and vanilla. Add flour mixture in three batches alternating with two additions of buttermilk. Mix well after each addition. Stir together the baking soda and vinegar in a small bowl and add to the batter. Mix on medium speed for about 10 seconds. Sift together the flour, cocoa powder, and salt. Set aside. In a standing mixer with a paddle attachment, combine the oil and sugar until incorporated. With it on low, add one egg at a time until completely mixed together. Add the food coloring and vanilla. Alternately add the flour mixture and buttermilk in two batches, starting with the flour. Scrape down the bowl with each addition and beat until thoroughly combined. In a small bowl, whisk together the baking soda and vinegar. Set the mixer to medium and add the baking soda and vinegar mixture. Mix for about 10 seconds. Bake at 35o degrees. *Note: listed is the original recipe. When I made this recipe, I did a HALF batch with about 1 oz of BEET JUICE with 1 tsp of gel food coloring and 1 tsp of cinnamon. As I mentioned, I used beet juice in the recipe above. What I did was I microwaved some baby beets I had in the fridge and blended it in a juice blender. I was trying to puree it with adding some water to it but it just turned into small chunky bits. So I just added some warm water to the pulverized beets and let it sit for a few minutes. I strained it and added it to the oil and sugar mixture. It didn’t quite have as deep of a color as I hoped. After adding the dry ingredients, the cocoa powder overwhelmed the light color of the beet juice so I had to add more food coloring to achieve the deep rich color. Waldorf – Dry, dense, and not as flavorful. Martha Stewart – Pretty moist, ok flavor, but color wasn’t intense enough. Confetti Cakes – Ultra moist, intense and rich flavor, with a deep beautiful red color.